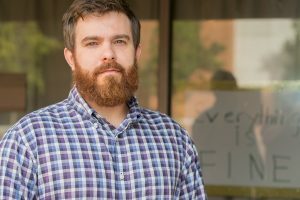 The Department of Writing and Rhetoric welcomed new instructor Dr. Caleb James in Fall 2017. Dr. James received his Ph.D. in Rhetoric and Writing from Bowling Green State University in May 2017. His bachelors and masters are from the Professional and Technical Writing program at UA–Little Rock. As an undergraduate student, rhetoric and writing appealed to him because it was “fun” to practice and theorize communication. Dr. James is teaching RHET 3326: Technical Writing and RHET 1312: Comp II, including online sections of the tech writing classes. He likes teaching these courses because they’re important for giving students foundational skills for academic and professional writing settings, and he tries to assign projects that will challenge students but contribute to their feelings of preparedness. He hopes to continually refine his teaching practices and approaches to be responsive to students’ needs. Dr. James is also working on publishing on transfer and resistance in graduate student education.